The highlight of yesterday's opening day at Yankee Stadium — okay, maybe not the highlight — was the bewildered crowd's reaction when Nick Johnson walked to the plate in the bottom of the first to Miley Cyrus's "Party in the USA" blaring over the stadium loudspeakers. While the rest of the crowd was alternately laughing and chanting "Mi-ley Cy-rus," we tried to think of reasons why Johnson, who is a grown man, would choose the song. 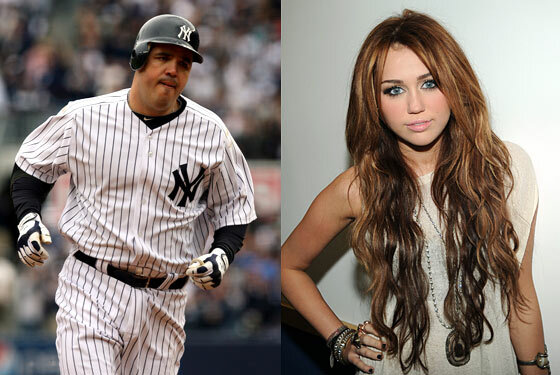 Here's what we came up with: He's got a kid who likes the song; he lost a bet, probably to Nick Swisher; or he's just a big Hannah Montana fan. The good news? The actual reason was the first of those: Johnson picked it to surprise his 4-year-old daughter, who was in attendance. The weird news: Johnson admitted he liked the song, too, telling the Star-Ledger, "I'll get up in the family room and sing it. It's got a good twist to it."